The Nutty Pumpkin Martini rocks with fall flavors such as pumpkin, hazelnut, nutmeg and vanilla. Good news! I’ve got your last minute offerings for the Halloween party-goer assigned to bring the spirits (the pun, sadly, was very much intended, ha!). Pumpkin continues to be in demand, particularly for this holiday weekend, and I have several other suggestions of variations and recipes to try for the Perfect Pumpkin Martini. Combine ingredients in a shaker with ice. Shake vigorously. Strain into a cocktail glass. Garnish with your choice of a little whipped cream or grated nutmeg (if you’re not a huge w/c fan like me). If you’re possibly sick of Pumpkin already (gasp! Did you start on those Starbucks Pumpkin Spice Lattes a bit too early? ), here’s another earthy fall flavor to snuggle up with – port wine. Oh yes. A ruby port such as Sandeman Founder’s Reserve actually makes for a wonderful, although probably unbeknownst, ingredient in a fall cocktail recipe. Of the many suggested methods for creating cocktails on their Facebook page, the Diavlo to me looks to be a cocktail worthy to make an appearance at a Halloween party. I’ll let you know how it turns out this weekend! Have another recipe inspired by fall to share? Feel free to share your recipe with Hiram Walker by entering the Fall Cocktail segment of The Quest, the brand’s search for the country’s most creative original cocktail recipes. You have until Halloween itself to submit your recipe for a chance to win an Apple iPad! Wishing you a fun and festive Halloween! Edit 10/28/11: Another great pumpkin cocktail recipe has come my way, the ABSOLUT 100 Pumpkin Martini. 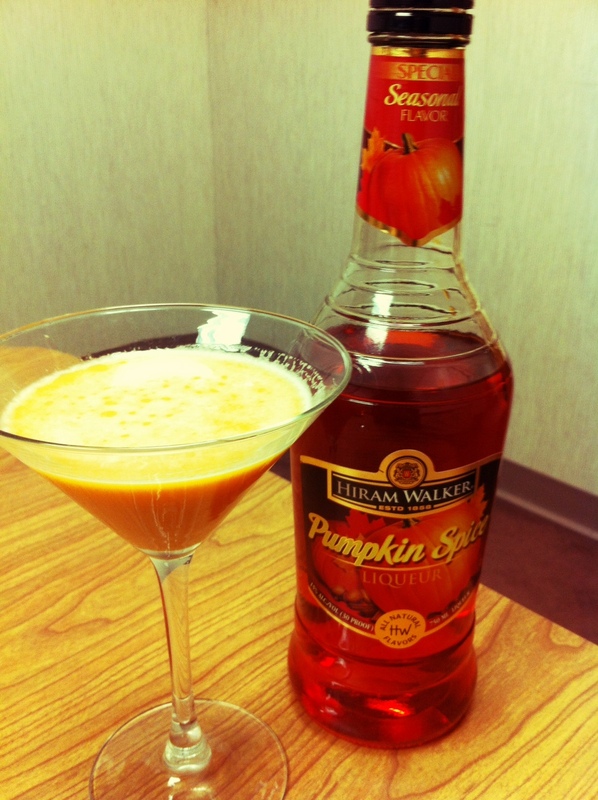 For an extra dose of pumpkin, check out this and the other recipes as featured on Liquor.com. Today is January 9th, which means there are probably still some (or lots) of you out there who’ve not yet broken your New Year’s resolution to watch what you eat and drink. I’m all for trying to live a more healthy lifestyle, but do you really want to spend the next few cold winter months cooped up in the house eating Nutrisystem and drinking overpriced mineral water? I didn’t think so. Stir ingredients in a preheated mug and enjoy! Stir ingredients to combine in a highball glass filled with ice. Garnish with a lime wedge. Combine ingredients in a champagne flute and serve. Combine Malibu Coconut Rum and Light Cranberry Juice in a highball glass filled with ice. Add Diet Lemon-Lime Soda to top and garnish with a slice of lime. Combine ingredients in a cocktail shaker filled with ice and shake thoroughly. Strain into a brandy snifter and garnish with an orange slice. Muddle the lime wedge and Beefeater Gin in the bottom of a Collins glass. Fill glass with ice and add Light Lemonade. Tumble and serve with a lime wedge garnish. As promised, I have a few Sandeman Port Cocktails to share from last week’s Thursday Drink Night. For the full list (and transcript of the evening) keep an eye on the Mixoloseum Blog. The winning recipe from this TDN (which hasn’t been officially announced just yet) will be published in an upcoming Mud Puddle cocktail guide that will be available in all Borders stores in the US! Build over ice and squeeze in a lime wedge. Swizzle. Top with 1.5oz ginger beer and 1/2oz dark Jamaican rum. Strain over rocks. Top w/ 2 oz of ginger beer. A quick announcement for all you boozehounds and cocktail aficionados—Sandeman Port is sponsoring Thursday Drink Night tonight at the Mixoloseum chat room. Join us from 7pm (EST) till God knows when, as we throw out Port cocktail ideas, give them a try on the spot, critique, and discuss. Ted Emerson, Brand Director for Sandeman will be joining us from 7-8pm to field questions so don’t be late! What’s that? You’ve never been to the Mixoloseum? Easy Peasy…just go to their site, make yourself a username/password and come right in! It’s open to the public and we love to see newcomers! At the very least, check in here later for an update on all the evening’s fabulous creations. I now leave you with an awesome drawing of myself participating in Sandeman TDN. Take that Dr. Bamboo! Cheers! This time of year it’s unlikely a weekend passes without some sort of holiday party or gathering to attend. I love to cook and often jump at the chance to make a dish to share like my awesome cream cheese & sausage stuffed mushrooms, or my yummy spinach-artichoke dip. But I’ve got to tell you—I’m just exhausted. The holiday shopping, planning, decorating combined with the fact that its dark half the day has already taken its toll on me. I’m looking for the easy way out, but I still want something that everyone at the party will love. So, what did I bring to Thanksgiving this year? A bottle of Sandeman Port Founder’s Reserve. Only a few people at dinner had ever tasted port, and they were eager to try something new. So, I served it up with dessert and it was a huge hit! Sweet, fruity, and a little bit nutty, I found it absolutely fabulous just sipped straight. I left the remaining half of the bottle with my parents and, I’m told, it didn’t last too long. If you really prefer cocktails, you should try working port into them. There were a few entries in the Hiram Walker Gingerbread Cocktail Competition that used port & on Thursday, December 18th, Sandeman is hosting Thursday Drink Night over at the Mixoloseum. All night, cocktailians will be mixing innovative new cocktails using the product, providing us all with fantastic ideas for our own holiday parties! If you haven’t already, sign up and join in on the fun!